The approach in the experimental project is to compare MBC under different grazing regimens in 2016 and 2017, at the same time collecting data for productivity of forage and cattle. Objectives are: to determine if MBC can be used as an indicator of soil health; and, to compare soil health in planned grazing compared to continuous grazing. Microbial biomass N and microbe C:N ratio are also being determined to investigate changes in fungal and bacterial activity in soils of greater or reduced soil health. Grazing paddocks at Brookdale. 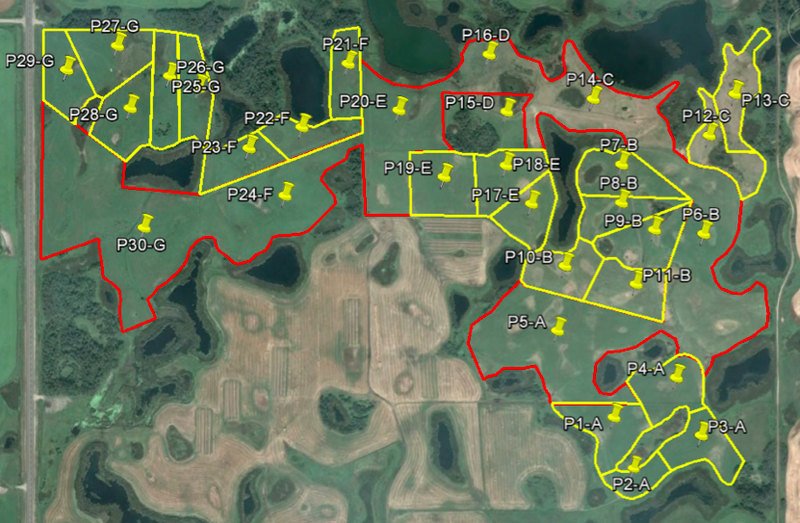 Paddocks with continuous grazing are shown in red, while those with planned grazing are shown in yellow. Replicate E was used for hay in part of 2016, and did not form part of the grazing study statistically for the year, other than as a connection for cattle movement between the continuous grazing paddocks P24F and P16D on either side. he planned grazing herd in the field at Brookdale on June 26, 2016; photo by T. McGonigle. se of the soil probe in the field at Brookdale June 17, 2016; photo by Kaylin Liddle. 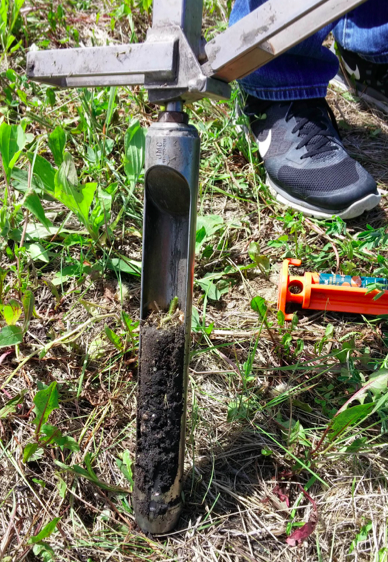 Collection of a soil sample in the field at Brookdale June 17, 2016; photo by Kaylin Liddle. Partial air drying of a soil sample in the laboratory at Brandon University, June 28, 2016; photo by Kaylin Liddle. Weighing of a soil subsample for fumigation in the laboratory at Brandon University, Oct. 11, 2016; photo by Kaylin Liddle. Soil health and soil quality are defined in terms of productivity, such as for forage biomass and animal weight gain. Both terms are similar, but soil health has an emphasis on biological processes. Agriculture needs indicators of soil health to give inexpensive and timely prediction of the level of production expected to follow. In this way, inputs can be increased or decreased as needed. In addition, remedial management can be undertaken to avoid ongoing productivity losses when an indicator reports a decline in soil health. The main aim of this work is to confirm experimentally the use of microbial biomass carbon (MBC) as an effective indicator of soil health in forage soils in the field. MBC is determined by fumigation of soil by chloroform. The C released from the soil in response to fumigation is a measure of the microbial C present. MBC offers promise as an indicator from both a theoretical and an empirical standpoint. A measure of soil health that relates to microbes makes sense theoretically, because processes relating to forage productivity are wholly or partly microbial in nature. Principally, these processes are residue breakdown, release of plant minerals, uptake of nutrients by plants, and provision of soil structure for effective rooting. A meta-analysis of literature data1 provided empirical demonstration of the potential offered by MBC as an indicator of soil health. This literature analysis found that MBC was positively correlated with organic matter (OM). Moreover, MBC increased more steeply per unit of increasing OM for grassland soils, as compared to a lower slope for increasing MBC with OM of cropland soils. Grassland soils are expected to have an abundant active fraction of OM, whereas cropland soils are expected to contain mostly the passive fraction of OM. Thereby, MBC gives insight into the mobilization of the active fraction for nutrient cycling. MBC offers considerable promise as an indicator of soil health and is now being investigated in research in Manitoba. Our expectation is that both soil health and MBC will be higher under planned grazing, because planned grazing has a longer rest period between cattle grazing passes, and because planned grazing disperses the cattle feeding across more plant species. In contrast, cattle select preferred species under continuous grazing.